This unusual and rather delightful Georgian silver vinaigrette was made in 1812 by the silversmith Matthew Linwood, a renowned Birmingham toy maker *. It is of rectangular form. The front cover is bright-engraved with the words "souvenir" within prick-dot borders and roundel decorations. The back and sides with prick-dot decorations. Date letter "o" for 1812. Good hinge on both vinaigrette and grille. 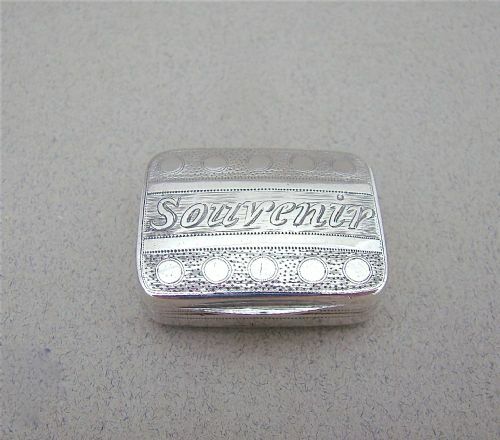 Silver "book" vinaigrettes are very sought-after and this is a wonderful example. Made by Joseph Taylor & John Perry in Birmingham 1836, it has engine turned decorations and reeded spine. Inscribed rectangular cartouche to the front. The grille intricately pierced with foliate decorations. T&P for Joseph Taylor & John Perry. Date letter "k" for 1833. The grille needs to "click" into place by gently pushing it down and forward before closing the "book". 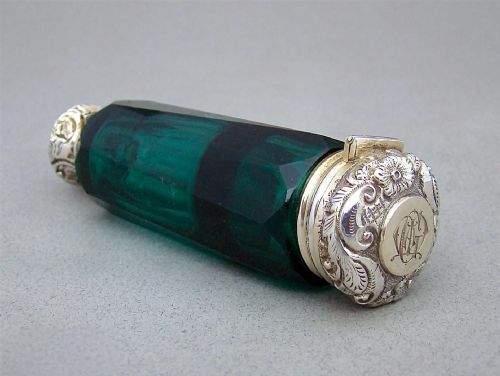 This is a rare and fabulous Victorian silver gilt & glass double-ended scent bottle and vinaigrette. The Bristol green glass faceted body mounted on one end with a screw-top and hinged silver gilt vinaigrette lid. 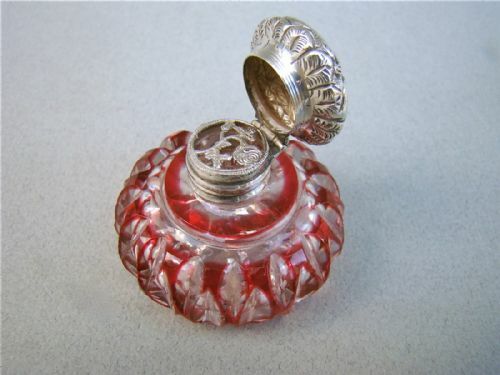 The scent bottle end with a conforming embossed hinged silver lid. Fitted with original glass stopper. Unmarked as it was very often the case with scent bottle lids but tested as silver. Length: 9cm - 3 1/2 inches. Diameter: 2.5cm - 1 inch. Inside of neck in excellent condition. No cracks. Silver lids in very good condition. This exquisite George III silver vinaigrette was made by the toy maker* Thomas Willmore. It is of oval form. The front cover set with an amber hard stone cabochon. The back is engraved with initials. Silver gilt interior with pierced grille. Complete with its original sponge. This delightful George IV silver vinaigrette has a very unusual cover. The background, engraved in the popular sea weed pattern, is applied with two flowers in relief. The rim with a similar relief flowerhead border. The back, bright-engraved with conforming sea weed decorations, is centred by a vacant rectangular reserve. T&WS for Thomas & William Simpson. Date letter "x" for 1821. 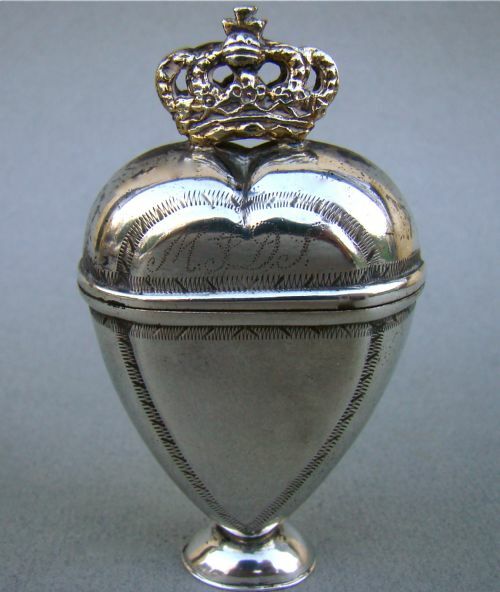 This delightful George IV silver vinaigrette has a very unusual cover. The background, engraved with a bark pattern, is applied with flowers in relief. A trademark work of Thomas & William Simpson. The sides with delicate prick-dot borders. This exquisite Georgian silver "valise" or "purse" vinaigrette is dated London 1818. It is in remarkable condition and of very good quality. 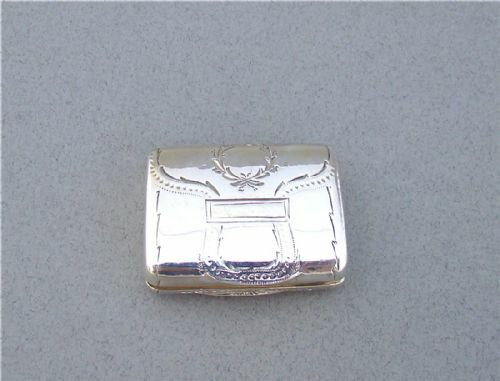 The cover is bright-engraved with a purse outline and a laurel wreath. The drilled foliate gilt grille is exquisite. Vinaigrettes are often hallmarked for Birmingham, the centre of toy making * in Georgian times. A London hallmark for vinaigrettes is very unusual. The silversmith Thomas Edwards worked at various addresses in Islington, London, in Ratcliff Row and then Clerkenwell. 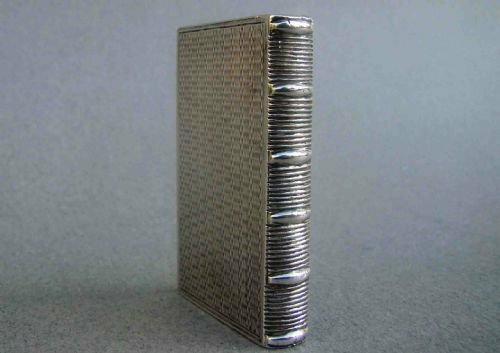 This very unusual and exquisite Georgian silver vinaigrette is dated Birmingham 1817 and was made by the toy maker John Bettridge. The cover with a relief depiction of a seed pod on a leaf. The background prettily engraved with foliate sprigs and surrounded by a delicate raised flowerhead border. The back, bright-engraved with conforming foliate decorations, is centred by a vacant oval reserve. The sides with prick-dot decorations. The pierced gilt grille engraved with flowers. Complete with the original sponge. Date letter "t" for 1817. 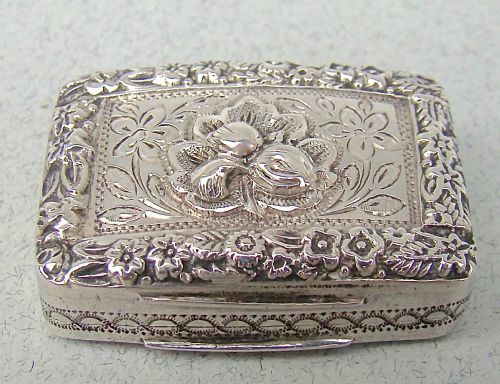 This exquisite Norwegian solid silver vinaigrette is called Hovedvansaeg. It literally means head-water egg: an egg to contain 'water' to revive the senses. It was with this type of box from Scandinavia that a young man indicated his intentions by presenting a 'hovedvandsæg' to the young lady of his choice. These spice boxes as they were also known were engraved with pinprick marks of the couples initials. 'Hovedvandsæg' are of various forms and date from about 1725. The earlier ones are heart-shaped and are marked inside the lid. This hinged silver heart-shaped 'hovedvandsæg' has a gilded crown on the top and stands on a weighted oval base. It has gilded interior, bright-cut engravings around the outline of the heart and is engraved with the couples initials "MJ . DS" on the front. Letter "B" possibly for the town of Bergen, Norway. Depth: 2cm . 0.7 inches. This exquisite William IV silver gilt "valise"vinaigrette or "purse" vinaigrette was made in 1833 by the celebrated Edward Smith. Of rectangular form, the front cover bright-engraved with a purse within a prick-dot border, the central part engraved with a flower head. The back is engraved with stylised leaves within a prick-dot border. 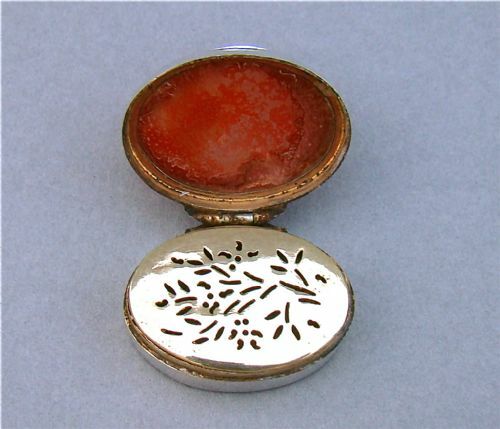 This delightful small silver mounted glass vinaigrette has a sliced cut cranberry glass body . 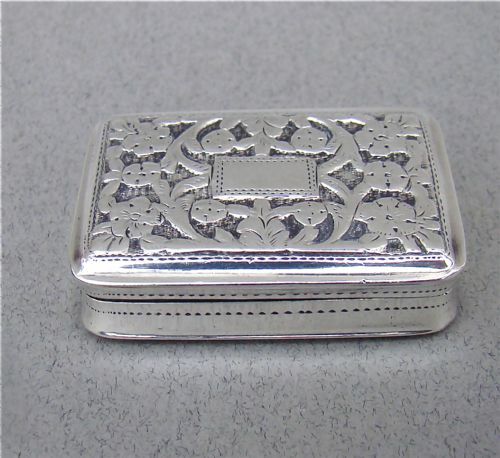 The embossed silver hinged lid with an exquisite pierced grille. 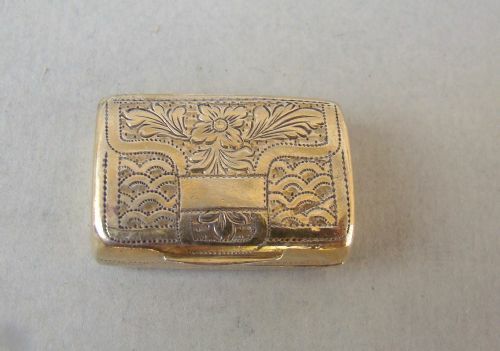 Not hallmarked, which was very common for scent bottles and vinaigrette lids of this period. Both lid and grille have been tested and are guaranteed silver. Diameter at widest: 4cm / 1.4 inches. The hinge and grille are in excellent condition. The glass body is in good condition. 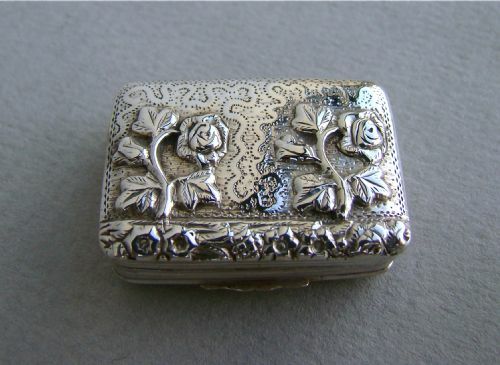 This exquisite Danish solid silver vinaigrette is called a Hovedvansaeg. It literally means head-water egg: an egg to contain 'water' to revive the senses. It was with this type of box from Scandinavia that a young man indicated his intentions to the young lady of his choice. 'Hovedvandsæg' are of various forms and date from about 1725. The earlier ones are heart-shaped. 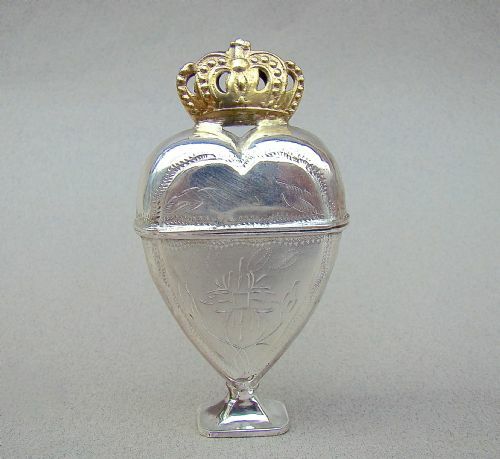 This hinged silver heart-shaped 'hovedvandsæg' has a gilded crown on the top. It stands on a pedestal base. The base is stamped 4 times with the maker's mark. The main body has bright-cut engravings around the outline of the heart. These spice boxes were often engraved with pinprick marks of the couples initials, as is this particular example, The initials "JM . OD" on the froint have become very faint with time. Maker's marks (unidentified) stamped 4 times.